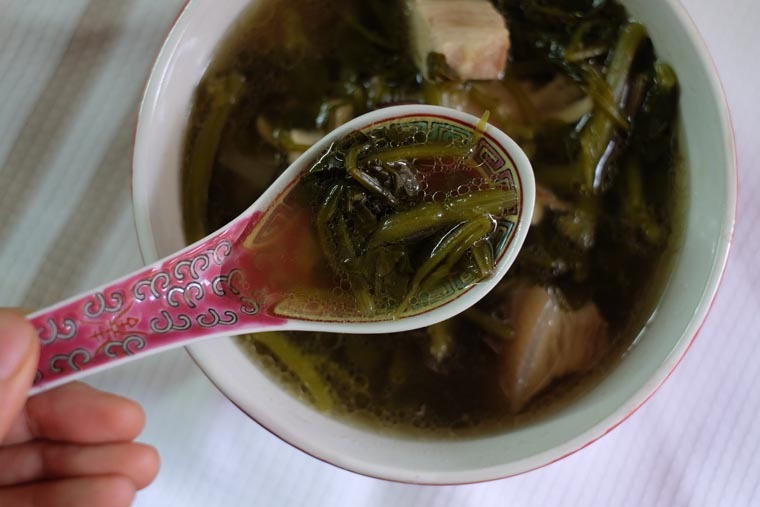 Slow-cooked soup is a must-have on my family’s dinner table. The golden liquid is placed on a pedestal; it brings not only comfort to our tummy and taste to our palate, but medicinal value to our body. Every soup that my family boils has a good reason to be served, other than being tasty. 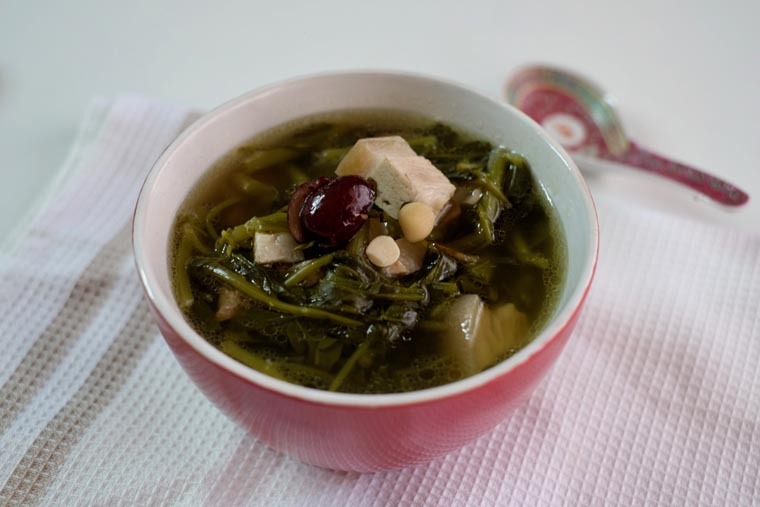 Watercress soup with almonds seeds is made when we want to strengthen our lungs. When Malaysia were choked in haze due to open burning in Indonesia, this soup was served often. Watercress soup is somewhat of a luxury to me. It’s not the price, but rather the fact that it perishes quickly that make this soup a rare treat for a busy cook. It needed to be cooked on the same day or at most the next day, otherwise the vegetable will wilt. The concentrated taste of bitter-peppery watercress, with the alchemy of smoky dried squid and natural sweetness from the dates, to me, is phenomenal. Step 1 BLANCH PORK: Place pork into a pot of water. Bring to a boil. Remove the scum with a fine-mesh sieve. Remove pork and rinse under running water. Step 2 BOIL WATER: In another pot, add 2 L of water and bring to a boil. Step 4 PUT INGREDIENTS INTO THE POT: When water boils, put in all the ingredients into the pot. Step 6 REMOVE & SLICE MEAT: Remove meat from the pot. Slice into 1 cm pieces and return it into the pot. Step 7 SEASON: Season with salt and serve hot. Bring 2 L of water to boil. Then pour in watercress + 500 g pork meat (hind quarter) + 10 deseeded red dates + 1 honey date (halved) + 1 tbsp bitter apricot seeds + 1 sweet apricot seeds. Let it boil for 10 minutes. Then simmer for 3 hours. Season with salt. 1. 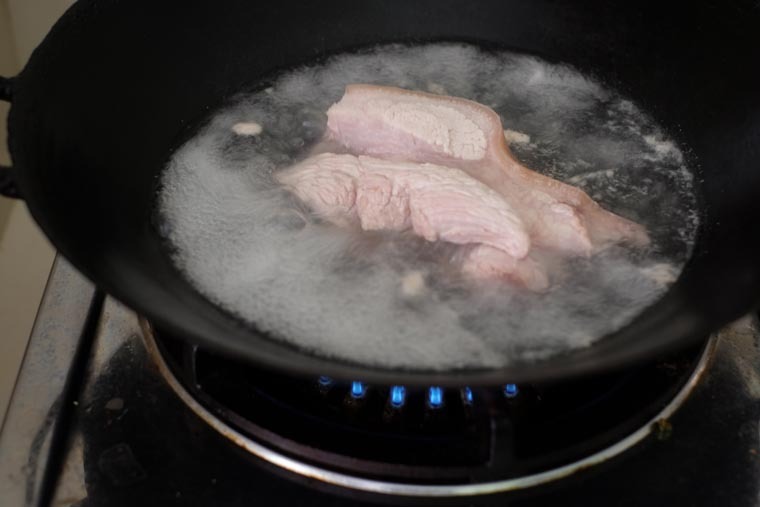 BLANCH PORK: Place pork into a pot of water. Bring to a boil. Remove the scum with a fine-mesh sieve. Remove pork and rinse under running water. 2. 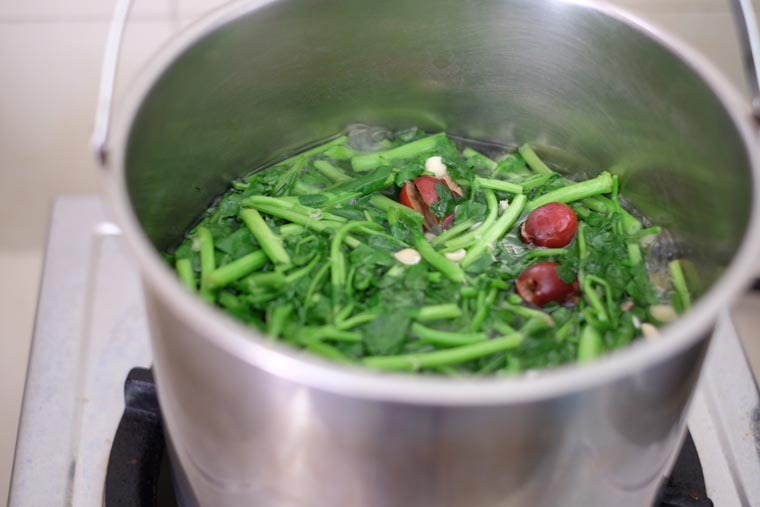 BOIL WATER: In another pot, add 2 L of water and bring to a boil. 3. 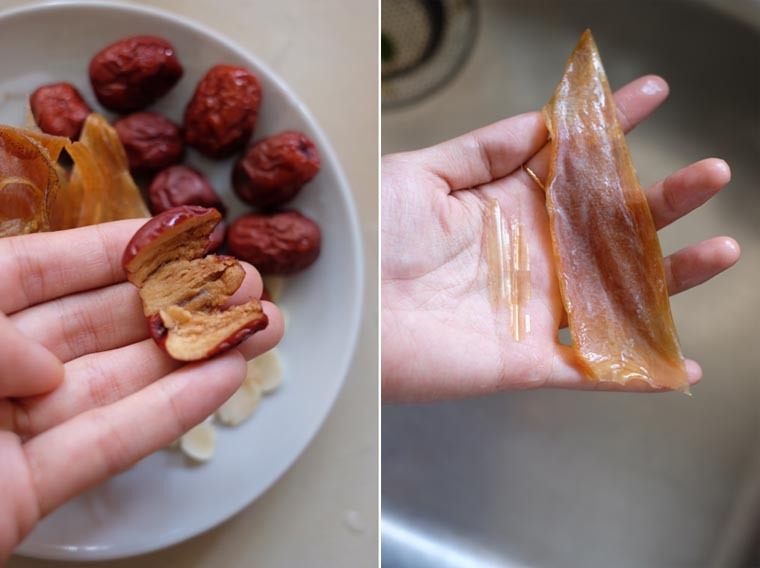 PREP INGREDIENTS: Slice honey date into half. Deseed red dates. Wash and snip watercress into shorter pieces. Remove the backbone in the middle of the squid; it’s a hard, plastic like film. 5. BOIL & SIMMER: Let soup for for 10 minutes. Then simmer for at least 3 hours. 6. REMOVE & SLICE MEAT: Remove meat from the pot and slice into 1 cm pieces. Return it into the pot. 7. SEASON & SERVE: Season with fine sea salt and serve hot. 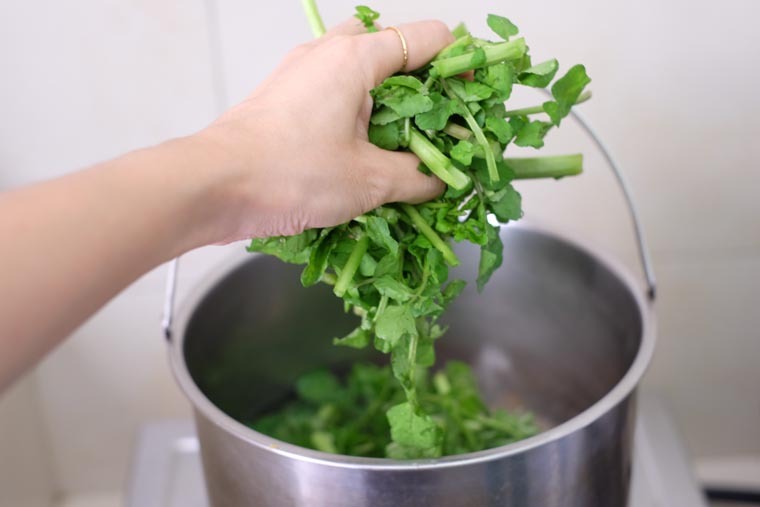 Do not cook watercress soup in a slow-cooker. Watercress must be cooked in boiling water. Otherwise, it will impart a bitter taste. For this reason, do not boil this soup in the slow-cooker where water will never come to a boil. Use a thermal cooker I normally slow-boil Chinese soup in the slow-cooker as I don’t want to be watching the fire for hours. Since I cannot use a slow-cooker for this recipe, I use a thermal cooker instead. After boiling the soup for about 20 minutes on high fire, I’ll transfer the pot into the thermal pot holder. The insulated pot will keep the soup temperature high, hence ‘cooking’ the soup for hours. Use pork meat. 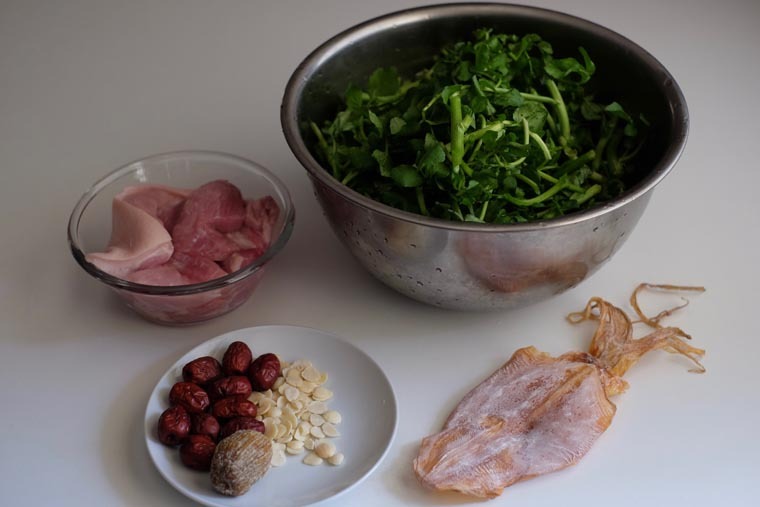 According to my aunt, an experienced cook with an interest in health, said that chicken shouldn’t be used to cook with watercress; the properties clashes and we will not get the full benefit of the watercress that way. I am not sure if it is an old wives tale though. 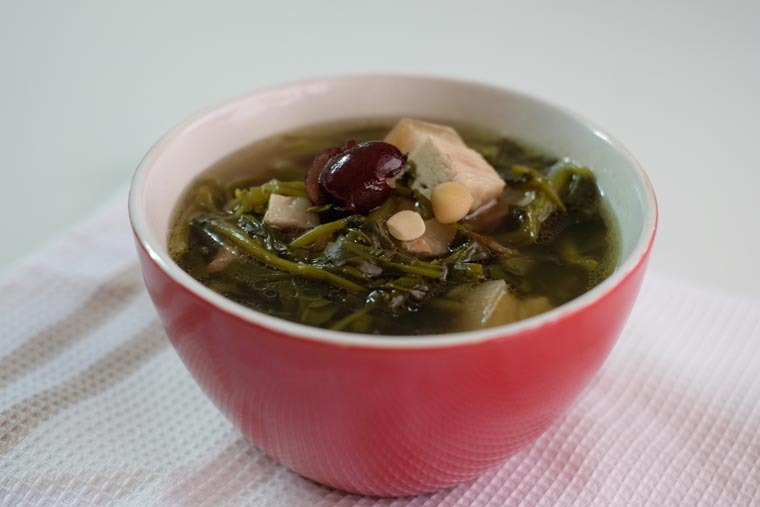 Do try to boil this soup, if not for its taste, for the nourishment it brings to your body. I’m sure you’ll enjoy it!